We’ve had a little work done just in time for wedding season. Our online gift registry has been polished-up and re-launched in time for all of those fabulous summer weddings. As part of your Homefest gift registry, you’ll once again have access to our online registry for your out-of-town guests or those who would prefer to shop from home. Now, what to register for? 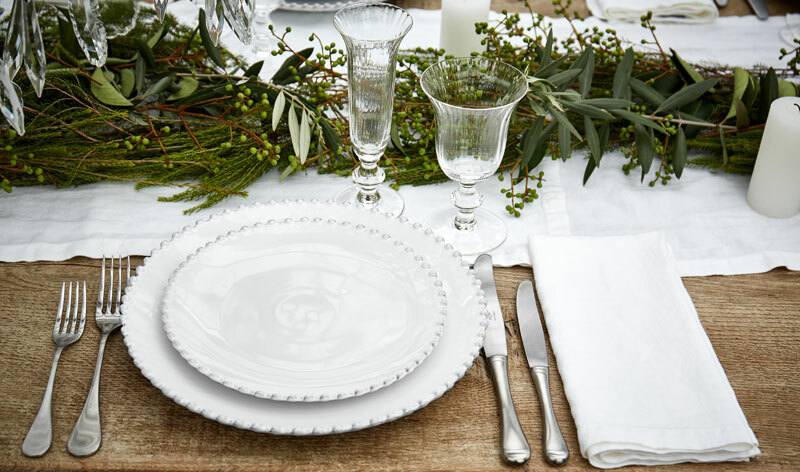 There is nothing wrong with white plates, matching serveware, and crisp linens…heck, we adore the classics, they’re timeless for a reason. But we also love bold colors, rich patterns, and authentic and imperfect hand-made pieces. With this in mind, we invite you to register with Homefest. We have your essentials covered but we also have hand-painted plates, festive barware, and one-of-a kind serving pieces…because your life together should never be boring. Ever wonder what you really need? Over the years, wedding registries have evolved from the traditional categories of china, silver, and crystal to charitable donations, honeymoon destinations, and beyond but there still are entertaining essentials every couple should consider when starting their life together. Gone are the days of registering for two sets of dinnerware, one of bone china in muted hues (that only gets dusted off for special occasions) and the other, a durable set of everyday white-ware. We want our dishes to reflect our personal style, to be elevated enough for a formal meal on a traditionally set table, yet functional enough for a take-out dinner scattered across the kitchen island. Material matters, so consider your lifestyle and how you’ll be using your dinnerware. At Homefest, we predominantly carry pottery, stoneware, and melamine. Earthenware or Hand-Thrown Pottery is made of natural clay. It tends to have a handmade quality with a more rustic, artisan-appeal. It offers great texture, color, and character but can be a bit more delicate. While dishwasher safe, it is more prone to chipping and should be used only briefly in the microwave. Stoneware is best for everyday use. It is highly chip resistant, comes in an array of colors, textures, and patterns, and is freezer, oven, microwave, and dishwasher safe. Melamine is family friendly, kid-proof, and great for outdoor entertaining. Our melamine lines are all BPA free and dishwasher safe; however, melamine products should not be used in the microwave. Whether you’re looking for an everyday set, something more specialty, or a collection that can do both, we’ve got you (and your table) covered. With collections from Costa Nova, Juliska, Match, Terrafirma, Vietri, and more, let us help you set your dream table, whether that be a full service for 12 or a few fun pieces to mix in with what you’ve already collected. Perhaps the most important items in your entertaining arsenal are your serving pieces. Whether you’re going formal or casual, serving a crowd or a few close friends, everything looks more appealing when dished-up in a beautiful serving piece. With charcuterie boards and canapé knives to start the night, oven-to-table platters and bowls for the main event, or festive dessert plates to end the meal, we’ve got all of your entertaining essentials. No table is complete without flatware and serving utensils that are inviting to the touch and weighty in the hand. With striking textures and patterns from Michael Aram, the sophisticated elegance of Match Pewter, rustic, burnished finishes from Simon Pearce, and timeless classics from Juliska, our patterns range from understated and elegant to bold and memorable. We’re all about celebrating life’s moments with a well-stocked bar… but unless you have the staff and storage of Downton Abbey, we’re big fans of multi-purpose barware. Start with the basics: your everyday drinkware, a set of wine glasses, and some DOFs (double-old-fashioned) for cocktails. When you’re ready to raise the bar (see what I did there?) try a coup, it’s got a great vintage vibe and is perfect for champagne, margaritas, martinis, or that craft cocktail. A stylish goblet makes a serious statement on your table and is great for water, wine, and even ice cream. A good stemless wine glass is perfect for apperitivo and can also double as a juice or water glass. And don’t forget about the accouterments; a stunning ice bucket will be used time and again for chilling wine or as a beverage cooler, a water carafe can double as a vase or decanter. No matter your need, we’ve got glassware for every occasion… and let’s be honest, a little libation now and then can’t help but make married life, well merrier! When it comes to wine services, we’re always asked about varietal-specific glassware and if it really makes a difference. Each varietal-specific glass is made with a particular wine in mind and helps it reach the appropriate area of your tongue to best capture its essence. If you’re like me, and that all sounds lovely but a bit over the top, we’d suggest a Bordeaux glass, it’s tall with a full-sized bowl and considered to be the standard red wine glass. If you’d like to add a second set for whites, we’d recommend a Chardonnay glass. It’s considered the standard white wine glass and is similar in style to the Bordeaux, just a bit smaller. If you’re a master somm in the making and ready to go deep into the world of wine glasses, come on in and we’ll help you find just the right glass for every nuanced varietal! Whether you are registering for a wedding, an anniversary, a birthday, or a new home, we’re here to make it fun and easy! We’ll help you create a thoughtful, well-edited registry that suits your lifestyle and provide you all of the information you need to make the process seamless. Plus you’ll get great perks like a 10% completion discount and a gift certificate from us worth 10% of the value of the purchases made from your registry. To get started, contact a registry consultant at 303-741-3920 or GiftRegistry@HomefestDecor.com.